MÁLAGA, Spain, Feb 16 2012 (IPS) - The Spanish government has decided to reform the country’s Immigrant Detention Centres (CIEs) in response to a wave of criticism of the way they are run, following the death of two migrants. But the announcement has not toned down the campaign for closure of what many regard as prisons. “We appreciate the government’s plan to approve regulations for the CIEs, as we had been demanding, and we hope it will guarantee the human rights of immigrants, although we continue to insist that they be closed down,” Mamen Castellano, the head of Andalucía Acoge (Andalusia Welcomes), an NGO that works on behalf of immigrants, told IPS. She was referring to the creation of regulations for the running of CIEs, and to “changes of a certain depth,” especially in the centres located in the southern Spanish cities of Algeciras and Málaga, announced by Interior Minister Jorge Fernández on Jan. 31. Human rights organisations complain that they are prisons in disguise. The report “Centros de Internamiento de Extranjeros en España. Derechos Vulnerados” (Immigrant Internment Centres in Spain: Infringed Rights), published in December 2011 by Migreurop, a Euro-African network of NGOs defending migrants’ rights, describes violations of basic rights of people interned in centres in Málaga, Algeciras, Madrid and Barcelona. SPAIN: Detained Immigrants "Are Treated Like Criminals"
“They are prisons in form and essence, in spite of the law stipulating that these centres cannot be correctional in nature, since the persons held there have committed no crimes,” the report says. “Internment, which should be an exceptional measure, is being used as a precautionary measure,” said Castellano. The country’s immigration laws provide for alternatives to internment in a CIE, such as withholding a person’s passport or ordering him or her to appear before a judge once a week. Castellano says she is in favour of regulations to govern CIEs, as a prior step to their being dismantled, “because a minor administrative offence should not lead to loss of freedom,” as it often does now. For her part, Salva Lacruz, in charge of the lobbying programme at the Spanish Commission for Refugee Assistance (CEAR) in Valencia, said “the regulations are a step in the right direction, but not a solution.” She regretted that closure of the CIEs is not on the government’s agenda. In Lacruz’s view, the death of two immigrants detained at these centres and the Migreurop report reveal “unacceptable” flaws, and “forced a reaction” from the centre-right People’s Party government, led by Prime Minister Mariano Rajoy who took office Dec. 21. A 41-year-old woman from DR Congo, Samba Martine, died of meningitis Dec. 19 while being held at the Aluche CIE in Madrid, and a 21-year-old man from Guinea-Conakry, Ibrahim Sissé, died Jan. 5, apparently of a heart attack, in the Barcelona centre. 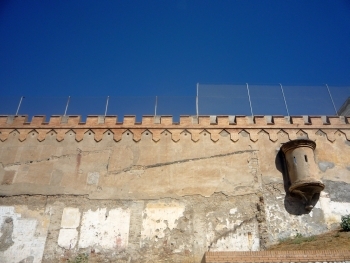 The Migreurop report calls attention to the deplorably rundown state of the CIE installations in Málaga and Algeciras, which in the past were deemed unfit for habitation, even as prisons, because of the risks to the health and safety of inmates. In fact, because of the threat of collapse at the CIE in Málaga, the local police canine unit was transferred out of the building – but immigrants are still held there. On Dec. 22, the Málaga City Council unanimously approved a proposal from the Izquierda Unida (United Left) group requesting that the building be condemned. CEAR Valencia, the anti-racist NGO SOS Racismo, Andalucía Acoge, Médicos del Mundo (Doctors of the World) and other rights groups and local neighbourhood associations are staging a campaign with the slogan “No to the immigrant detention centres!” aimed at closing down these centres in Spain and the rest of Europe, and at putting a stop to police raids to arrest migrants, Lacruz said. The civil society organisations also complain that racial and ethnic profiling is used in identity checks throughout Europe. The campaign to close down the CIEs has a daily presence on Facebook and Twitter, with hashtags such as #CIEsNO, #stopredadas y #razonesCIErre (meaning roughly “No CIEs”, “Stop the Raids” and “Reasons for Closure”) and a wiki page, whose users can add, modify, or delete content, has recently been created. Meanwhile a Valencia court is investigating a complaint lodged by several foreign nationals held in the city’s CIE, who reported being beaten, mistreated and humiliated by the police, according to a written complaint filed Nov. 4. All aspects of these centres, from security to health care and meals, are controlled by the police, who manage them and administer the finances. In prisons, on the other hand, police only carry out security duties. The reforms announced by the interior minister for Spain’s 12 CIEs include limiting police action solely to security duties and leaving the care of internees to unspecified “specialised staff”. According to municipal records for January 2011, 42 percent of immigrants in Spain are from other European countries, 30 percent are from Latin America, 23 percent are from Africa, and the rest are from Asia. In spite of the economic crisis plaguing Spain and the rest of the EU, the number of undocumented foreigners detained by the authorities at their point of entry into the country in 2011 was up by nearly 50 percent compared to the previous year, according to a report from the Interior Ministry.